The Value of a Great Strategic Plan is the first in a new category of Academy courses: Nonprofit Leadership. We want to share this new course with you—and you can view a sample of the course or take the course for free here. As a mission-driven organization, San Diego Zoo Global (SDZG) understands that nonprofits play a critical role in our society and also face unique challenges. The Value of a Great Strategic Plan is specifically designed to advance nonprofit organizational success. This course will show how a great strategic plan can help achieve maximum mission impact—without sacrificing financial sustainability. While long considered an organizational best practice, strategic planning has an especially important role to play in nonprofit organizations. Nonprofits are tasked with working to fulfill a mission, while at the same time maintaining financial viability. The important work of clarifying your core purpose and aspirations, making data-driven decisions, and building consensus and momentum around common goals becomes even more vital for nonprofits. This course will show you how a great strategic plan is crucial to helping nonprofits meet these challenges. At San Diego Zoo Global, we practice what we preach. We believe that strategic planning is not just important, but is an essential part of our success. The Call, SDZG's strategic plan, has generated a unified, laser-focus on our purpose of saving species and our vision of leading the fight against extinction. As a consequence, we now have unprecedented alignment across all levels of our organization—from front-line staff to our Board of Trustees—making it possible to achieve amazing results. The tremendous success of The Call was not mere happenstance. Not all strategic plans are created equal, and we invested in creating a great strategic plan. Our participatory approach meant that all key stakeholders had an opportunity to provide input, creating a sense of ownership among our constituencies. Our rigorous planning process meant the decisions we made about where to focus our efforts are based on data and information, not opinions. And, our strategic plan has the teeth to help us prioritize and make decisions—and this has pushed us to make bold moves and take on new challenges. This course will walk you through the critical elements of a great strategic plan, so that you can help your organization achieve maximum mission impact. In the course, we discuss the key differences between for-profit and nonprofit strategy, the basic anatomy of a strategic plan, and what makes for a great strategic plan. We share stories of how our strategic plan has created transformational change for SDZG, and the lessons learned in the process. Whatever the mission of your nonprofit or the challenges it faces, this course will show you how investing in a great strategic plan is essential to your success. Attending the AZA Mid-Year? If this topic is of interest to you, please let the Academy team know if you would like more information about this course, or nonprofit organizational success. For questions related to this article, please contact Robin Keith, San Diego Zoo Global, at rkeith@sandiegozoo.org. 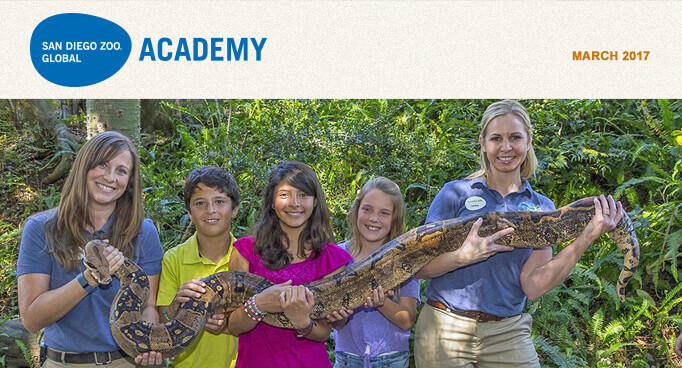 San Diego Zoo Global Academy Will Be at the AZA Mid-Year Meeting! Association of Zoos and Aquariums (AZA) gatherings are always a great opportunity to network in person, and the Academy team looks forward to seeing everyone again at the upcoming AZA Mid-Year Meeting in Albuquerque, New Mexico, March 26–31. Visit with our Academy team at the AZA Mid-Year Meeting, and find out more about newly launched courses, upcoming courses, and our 2017 Academy Reference Guide template. This new template can be used with other Academy materials to ease the rollout of online training at your institution. For 2017, we are extending the book club program offered to employees at San Diego Zoo Global to Academy subscribers, via the monthly newsletter. Why a book club? It is beneficial for employees to strive for balance in their lives, and reading a good book can provide a time for recovery and renewal. Each month in the Academy newsletter, we will ask a question related to the book club assignment. After three newsletters, you will have completed the same questions as SDZG employees. In the second quarter, we will have a new book club assignment. If you enjoy reading, enjoy the Roar Longer Book Club! The first quarter book club selection is Designing Your Life: How to Build a Well-Lived, Joyful Life, by Bill Burnett and Dave Evans. We decided to start 2017 with an inspirational and helpful book on living life to its fullest. This book is available from numerous booksellers, including Amazon. It can also be downloaded for Kindle, Nook, and iPad, and is available on iTunes and through other sources. Here's our March question related to the book: Have you ever experienced "flow," the feeling of complete engagement? If so, when? The Oakland Zoo in California is part of the Academy's collaborative learning environment! Please join us for the Administrator's Users Group Webinar, hosted by Academy partner CypherWorx. The next webinar is Wednesday, March 15, at 11 a.m. PDT. After registering, you will receive a confirmation email containing information about joining the webinar. Lockout-Tagout: Control of Hazardous Energy—The key purpose of OSHA Standard 1910.147 is to prevent an injury from unexpected start-up or release of stored energy. This course gives a basic overview of this standard and teaches participants how they can help reduce the number of fatalities and injuries, as well as establish a program and procedures for controlling hazardous energy. In January's column, I shared with you that it takes courage to launch into the unknown. That first column focused on encouraging you to prepare your staff for a new adventure with online training. Last month, in preparation for our voyage, we reviewed the importance of a compass for direction. Now we will consider the chart. Launching your own Academy training program is not unlike taking a sailing voyage. On this voyage, The Academy is the ship's name. Planning and preparation are vital, and there are a few essential navigation tools that you'll need before you leave the dock. It is always wise to begin with a destination in mind. The destination may be different for each institution, and it depends on multiple variables. Sailors plot their daily progress as they sail toward their destination, using a compass and a chart. The compass data is plotted on the chart, and the chart becomes a picture of the voyage. The chart reveals the distance traveled, the course direction, and speed. Importantly, the chart is based on the experience of others who have traveled before you, and it is also useful for revealing navigational dangers to avoid. San Diego Zoo Global began our journey aboard The Academy with our animal care staff on August 22, 2013. Our chart was in the form of a memo from our president/CEO, chief life sciences officer, and chief human resources officer, and it was sent to all animal care staff. The memo charted our new direction and the course we would follow as we set sail. A particular final destination was not established, as ours was to be a voyage of exploration—and we are still on this voyage. A few years later, in 2015, we updated our charts with a new document called The Academy Reference Guide. This new chart presented more detailed information to our staff about new courses, how to earn professional certificates, creating Do-It-Yourself training courses, and senior management's expectations for staff training accomplishments on this voyage. 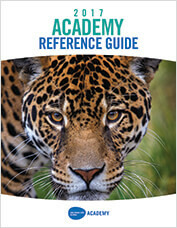 The Academy Reference Guide has become so valuable to us and others that we have decided to update it annually, and make it available to help you on your own institution's journey. The 2017 version is now ready. Academy Director Jon Prange and I will be at the AZA Mid-Year Meeting in Albuquerque, New Mexico between March 29 and March 31. We plan to bring a limited number of printed 2017 Academy Reference Guides, and we'd be delighted to hand you your own chart and discuss your voyage. Please stop by our booth to pick one up. The moment of the inspection report is here. It is also the hour, day, year, and simply the time of the inspection report. All aboard. That means everyone in the zoological world from newest hire to longest serving board leader. The U.S. Department of Agriculture (USDA) Animal and Plant Health Inspection Service (APHIS) Animal Care unit uses regular, ongoing, unannounced inspections to administer and enforce the Animal Welfare Act (AWA). The frequency of these standard facility inspections is typically annual, unless it is a repeat inspection to follow up on the annual inspection. Other focused, specialized inspections (for example, potentially triggered by a complaint, new animal arrivals, a noteworthy animal passing, a high-profile incident, or media attention) vary by facility, in accordance with a number of factors, including facility compliance history. A "clean" inspection yields a statement on the inspection report that "No noncompliant items identified during this inspection." When an inspector identifies an incidence where the AWA regulations are apparently not being met (for example, animal and veterinary care, facility conditions, or recordkeeping), that will be written up as a noncompliant item (NCI). The most serious noncompliant items are those with continuing adverse impacts on animal welfare, labeled DIRECT. When the same or a similar noncompliance is found during more than one inspection, it can be marked as REPEAT. 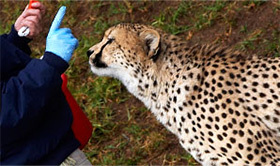 It is important to note that a noncompliance may be corrected in one location, but if the same general noncompliance is not corrected on the opposite side of the facility or in an adjacent mammal exhibit, this can be recorded as a repeat noncompliance. When a noncompliance is relatively minor, and the inspector believes the facility is likely to promptly address it, the inspector may inform the facility that it is being considered a "teachable moment." Teachable moments do not appear in inspection reports, but are treated as part of one's compliance record—which could become a significant concern in the event some subsequent findings spark agency review of the facility. Inspection reports are available to the public pursuant to the Freedom of Information Act (FOIA). FOIA and other federal laws, like the Privacy Act, may preclude release of certain limited information, but the general presumption is toward disclosure of the sum and substance of inspection reports. Under FOIA, inspection reports may be obtained pursuant to formal written and electronic requests. Significantly, inspection reports subject to an appeal are not posted online until the appeals process is concluded and a final inspection report is issued. Until recently, the agency has provided the most recent three years of inspection reports for every regulated entity via a searchable database (also including some other information), available 24/7/365 on the agency website. On February 3, 2017, the USDA took the database containing inspection reports offline (see public.govdelivery.com/accounts/USDAAPHIS/subscriber/new ) and posted an alert of the removal on the web page where the database had been available. The response to this action has been overwhelmingly critical, and the situation has been covered repeatedly in mainstream and social media. Regulated community accreditation organizations, such as the Association of Zoos and Aquariums (AZA), have weighed in, calling for the restoration of the database, stating that its availability helps demonstrate good compliance records (and animal welfare) essential to maintaining the public trust. Litigation has ensued, and the individuals and organizations involved recited a litany of ways in which they use inspection reports. Such uses include monitoring AWA compliance and animal care and welfare; tracking animal acquisitions/transfers and reviewing potential placement locations for rescued animals; framing complaints to USDA and related litigation; and scholarly and other research on all of the above. Inspection reports are also used in administering state and local laws that regulate and prohibit the sales of domestic dogs from commercial breeders with problematic compliance histories. The agency has been reposting portions of the re-reviewed inspection reports, and has invited FOIA requests (which can often take extensive time periods to process) for records that are no longer available online. There is no announced timeframe for the completion of the re-postings and restoration of the database. Applying the Excellence Beyond Compliance® approach, the zoological community (and others) can take this situation and "make it better" in a way that truly serves the interests of animals. Everyone in your organization should have some awareness of the AWA, inspections, and inspection reports. Raising awareness internally opens the door for everyone to contribute to AWA compliance and animal welfare. Examples: picking up litter, detecting unusual animal behavior, or reporting facilities issues. Key leaders and officials should be briefed and updated on inspections, inspection reports, and corrective measures/improvements. Board members, directors, management, animal and veterinary care, communications and marketing, facilities, and security staff should have current knowledge of compliance history. Take time to find and review your inspection reports online, and all reports for at least the past 10 years. If there is a noncompliance (including teachable moments) in your history, ask whether any such conditions exist or are likely to reoccur, and what should be done to improve things. Then, get into action making improvements. Review other facilities' inspection reports (zoological organizations, facilities in your state, or the site of a recent high-profile situation). There may be issues elsewhere that prompt a fresh look at your own operation. Conduct an internal debriefing immediately after every inspection/inspection report. Take stock of what went well and things to improve. After a clean report, challenge yourself to find new ways to advance your work on behalf of animals. Address and document corrective measures/improvements. Act promptly yet thoughtfully to make things better, and document that work to demonstrate good efforts and to start off the next inspection. The above measures would: (1) make this information more readily accessible and transparent; (2) stress the importance of striving to maintain consistent compliance; (3) foster continuous improvement, especially in animal care and welfare; and (4) further demonstrate the zoological community's commitment to AWA compliance and animal welfare, in a manner that justifies and validates the public trust. These ideas seek to make the most good come from the current USDA database situation, as well as spur each zoological organization to be its very best every day in making animals' lives better.